Recently RancherMan & I enjoyed a vacation with my siblings in New Braunfuls, Texas. It was a great time filled with family, sight seeing, shopping & some pretty fancy restaurants. We all even got to enjoy a concert at the famous Gruene Hall. And as luck would have it, we were visiting during Market Days weekend too. Market Days is an outside market filled with vendors of many different kinds. Craftsmen were selling anything from hair clips made from vintage silverware to hand-made leather pistol holsters. Then I spied a vendor who was selling baskets, and I’ve wanted a basket for years. To me they’re beautiful and very functional pieces of art. 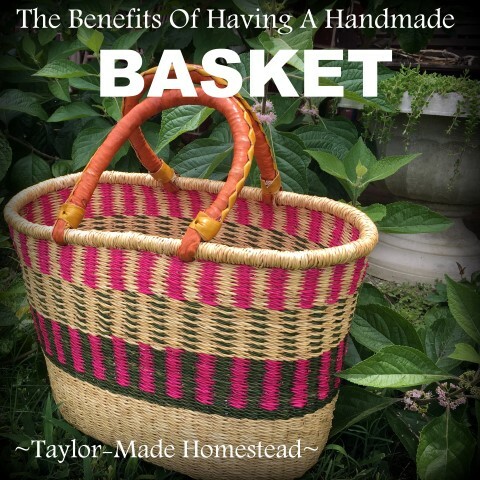 On this day I picked out a gorgeous, roomy hand-made basket with leather handles. It even had strips of bright pink woven in. Since becoming a breast cancer survivor I enjoy having splashes of pink around me. This basket is beautiful, I love it! This post may contain affiliate links (marked with *) If you decide to make a purchase through one of the links contained in this post I may receive a commission. But the price you pay will NOT be changed. It’s an easy way to support this blog without anything coming out of your pocket. So if you’re interested in buying something, don’t be shy – click away! You can read my entire affiliate disclosure under the ‘Legal’ tab above. There are many ways I’m using this basket. But today I’ll focus on how it’s had a positive environmental impact. It’s another way I’ve been able to eliminate plastic shopping bags! Y’all know when I’m shopping I shun plastic bags like the plague. To be able to refuse plastic shopping bags I usually take my reusable cloth bags with me when I’m shopping. Much of our typical shopping is for small quantities, so I was hoping to use this basket now when I’m doing my shopping. As it turns out it works GREAT for that purpose. I have no problem dropping my planned purchases into this basket as I stroll down the aisles. It’s a large basket with a wide-open top. Nothing’s hidden so I don’t feel the shop owners are worried that I’m stealing anything. And of course all the local shop owners know RancherMan & me so I certainly don’t worry about that when shopping locally, but even when shopping in the ‘big city’ I feel my shopping is certainly as visible as if I were carrying those items in my arms. Then when I get ready to pay for my purchases I place my items on the counter. I tell the clerk that I’d like these items placed back into my basket. Since the basket holds itself wide open it’s so much easier for them than trying to wrestle my items into a fabric bag. I’ve lost count of the number of compliments that I’ve received on this beautiful shopping basket. I’m sure many others are now considering getting a basket of their own. Hey, any way I can help further environmental awareness without being preachy is a good thing for me. Actions certainly speak louder than words! C’mon by & sit a spell! Come hang out at our ~TMH~ Facebook Page . It’s like sitting in a front porch rocker with a glass of cold iced tea. There are lots of good folks sharing! And you can also follow along on Pinterest, Twitter or GooglePlus. This entry was posted in Blog Posts and tagged Environment on June 21, 2017 by Texas Homesteader. This bag is beautiful, I’d want to show it off all the time too! And I love anything that helps reduce plastic bags. 😉 Thanks for sharing on the #WasteLessWednesday blog hop! I’m loving that basket!!!! You don’t have any info on the people who made do you? I can see all my hairdryer/brush items in there or my cleaning bottles and towels. It’s not only functional it’s so beautiful!! I live in Illinois and good luck finding anything like this, except made in China. I also carry pink with me. Mom died 12 yrs ago from breast cancer, came back for the second time and spread everywhere. It’s been 17 yrs ( I was 37) this June since my double mastectomy, I’ve been all clear since. I use canvas / cloth bags when I do grocery shopping, Home Depot shopping, etc. (no plastic bags brought home here) I do love your basket. Nice basket for your grocery items and would also probably be great for caring in your fresh picked garden veggies, etc. I have canvas bags too and although I *have* used them to carry my purchases as I was shopping before going to the register, I always worried that it looked like I was stealing. With this basket I don’t worry about that false perception since it’s wide open. And it’s much easier for the clerks to load than the cloth bags were. But I’ll still use my cloth bags for larger shopping trips when purchases won’t fit in the basket. I’d say about 85% of the time this basket will fit the bill. Love it! Tammy, one more compliment here~ I love it. I have my canvas bags, but have been eyeing baskets like yours. My mom bought one a couple years ago and loves it. I will, but have to be in the right frame of mind to splurge on myself. I’m thinking this fall I will be to an event that has some beautifully made ones. Just maybe. . . 😉 PS I too avoid those plastic bags like the plague!